Cupressus macrocarpa is a medium-sized coniferous evergreen tree, which often becomes irregular and flat-topped as a result of the strong winds that are typical of its native area. We see the cypress all around the Monterey Peninsula; perhaps we often forget how unique this tree is. There are only two native stands of Monterey Cypress in Pebble Beach and at Point Lobos (appropriately enough at Cypress Point.) 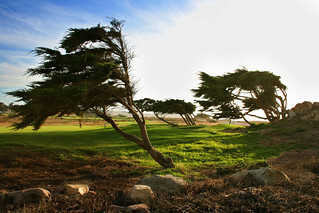 The State of California list Monterey Cypress as a Category 1 Rare and Endangered species. They can live up to 2200 years old, even though the exact number is being disputed.